Tag line: "This mad wizard kills at will in Satan's service!" Trivia: The story was adapted from the novel The Edge of Running Water by William Sloane. The Devil Commands tells a fascinating story, that of a scientist who, having discovered a means for recording human brain wave activity, utilizes his research in an attempt to communicate with the dead. Of course, the fact that the scientist is played by none other than Boris Karloff doesn't hurt matters, either. Dr. Julian Blair (Karloff) is a University scientist who believes he's found a way to map the distinct pattern of human brain waves, a precursor, he believes, to being able to read one's mind. But when his beloved wife, Helen (Shirley Warde), is tragically killed in an auto accident, Blair refocuses his attention, using his research into brain patterns to try and build a machine that will allow him to communicate with the dead. Having moved his laboratory to a secluded New England mansion, Blair cuts himself off from the rest of the world, and not even his daughter, Anne (Amanda Duff) or Richard (Richard Fiske), his faithful assistant of many years, are able to dissuade him from continuing his mad experiments. Things go from bad to worse when a nosy maid (Dorothy Adams) uncovers the true nature of Blair's 'experiments', which are more ghastly than anyone could have ever imagined. Throughout The Devil Commands, we watch as Dr. Blair slowly descends into madness, a fall made all the more tragic thanks to the multi-layered performance of Boris Karloff. As the film opens, Blair is demonstrating his equipment for reading brain patterns to a group of his associates at the University, during which he possesses both a sharp mind and an eager attitude. His wife, Helen, even makes an appearance, interrupting the experiment to remind Blair that they're picking their daughter up at the train station later that evening. The love Blair feels for his wife is well conveyed in these scenes, which only deepens our feelings of remorse when she's killed a short while later. The death of his wife proves much too much for Blair. Blair's daughter, Anne, who also acts as the film's narrator, says at one point “I lost my mother that night, and when she...went away, I started to lose my father, too”. The incisive, intelligent man we were introduced to at the start of the film slowly disappears before our eyes, replaced by one who will stop at nothing to reconnect with his dead wife, not even grave-robbing. Like the type of character one might expect to find in a story penned by Edgar Allan Poe, Blair is a truly tragic figure, a man who has thrown his life away in the pursuit of love, and Karloff is nothing short of brilliant in the role, carrying us from one extreme to the next with the greatest of ease. The Devil Commands does fall apart in the end, resorting to the age-old cliché of angry townsfolk storming the mansion (I swear one of them had a pitchfork), ready to dish out their own brand of vigilante justice on the man who's caused so much grief in their community. 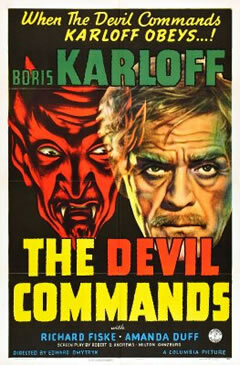 That slight failing aside, The Devil Commands does succeed in weaving an interesting tale, with a great performance from Boris Karloff to support it.